RAYAGADA: The long-standing demand of Maoist-hit Chakkaguda and Mariguda people - a bridge over the river Nagavali - will soon be fulfilled. 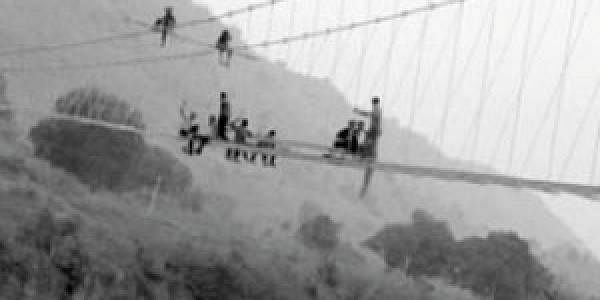 &nbsp;Under the Integrated Action Plan (IAP) for the Maoist-prone areas, a 151-metre hanging bridge over the Nagavali is coming up fast connecting these villages to the outskirts of the town. &nbsp;Work on the bridge is apace and likely to be completed by March 25. The estimated cost of the bridge is ` 1.5 crore and the Odisha Police Housing Board is executing the project. &nbsp;Officials of the district administration said the suspension bridge, the second of its kind in the State, is being constructed 100 feet above the river. The only other suspension bridge is at Dhabaleswar. &nbsp;On its completion, villagers of eight panchayats - Karubai, Bodo Alubadi, Baising, Dangolodi, Durgapadu, Mirabalir, Tolo Alubadi and Erkubali - would need to travel just 5 km to reach Rayagada town. The people have been making a detour via the Kolnara block headquarters, 25 km from the area to reach Rayagada. &nbsp;Even as the villagers had been demanding the bridge, none paid heed forcing them to&nbsp; build a bamboo bridge with the help of local SHGs three years back. Realising the problem, the district administration last year made a proposal to the State Government about the bridge which was approved. Subsequently, work was started in November with IAP funds. “The work on this suspension bridge was taken up on a priority under the IAP. It is likely to be completed by March 25,” said Rayagada Collector Nithin Bhanudas Jawale.